GREENSBORO, NC - First National Bank, the largest subsidiary of F.N.B. Corporation (NYSE: FNB), and the Greensboro Grasshoppers, the Class A minor league baseball affiliate of the Pittsburgh Pirates, today announced the extension of FNB's naming rights agreement for First National Bank Field - home of the Grasshoppers. "We are excited to extend our relationship with the Grasshoppers and reaffirm our commitment to the Greensboro region," said David R. Edwards, Jr., Regional Market Executive and President of FNB's Piedmont Triad Region. "Beyond the benefits of associating with a first-class organization like the Grasshoppers, we look forward to partnering with them on various community outreach initiatives that help strengthen our local Greensboro area." "First National Bank has been a great partner and we are excited to extend our relationship for another five years," said Donald Moore, President and General Manager of the Greensboro Grasshoppers. "We are happy that the bank sees the value in our partnership and look forward to working with David and all of his team for many more years," Moore continued. 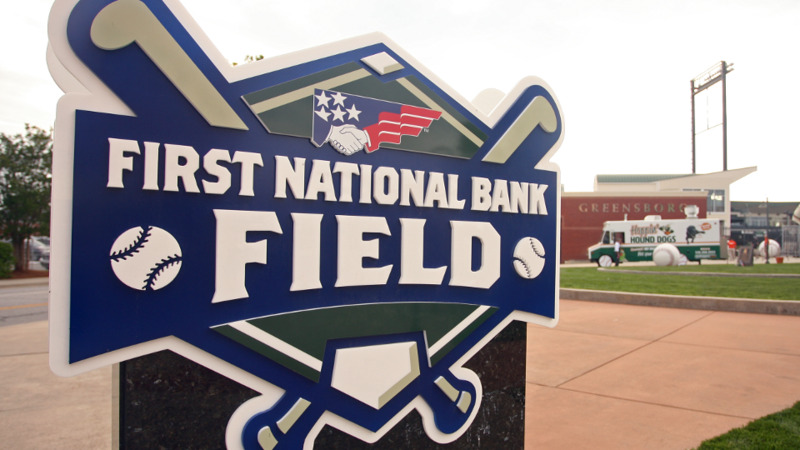 Visitors to First National Bank Field will have access to two on-site First National Bank ATMs, part of FNB's extensive, multi-state network of approximately 400 branch locations and more than 550 ATMs. The Greensboro Grasshoppers open the 2019 season on Thursday, April 4 against the Hagerstown Suns. Sponsorship opportunities, season tickets and mini plans are now on sale for the 2019 season. For more information, please contact the Grasshoppers office at 336-268-2255 or visit www.gsohoppers.com. First National Bank of Pennsylvania, the largest subsidiary of F.N.B. Corporation (NYSE: FNB), has approximately 400 full-service locations in Pennsylvania, Ohio, Maryland, West Virginia, North Carolina and South Carolina. In addition to a comprehensive suite of traditional banking products and services, the Bank also provides a full range of online and mobile banking solutions for consumer and business clients. First National Bank has been recognized repeatedly as a best place to work in Pittsburgh, Pennsylvania, its headquarters city. F.N.B. Corporation (NYSE: FNB), headquartered in Pittsburgh, Pennsylvania, is a diversified financial services company operating in six states. FNB holds a significant retail deposit market share in attractive markets including: Pittsburgh, Pennsylvania; Baltimore, Maryland; Cleveland, Ohio; and Charlotte, Raleigh, Durham and the Piedmont Triad (Winston-Salem, Greensboro and High Point) in North Carolina. The Company has total assets of $32 billion, and approximately 400 banking offices throughout Pennsylvania, Ohio, Maryland, West Virginia, North Carolina and South Carolina.